Redco™ Polyvinyl-chloride (PVC) has good heat and chemical resistance. Excellent for outdoor applications. Redco™ Polyvinyl-chloride (PVC) is paintable and weather resistant with a high tensile, compressive, and flexural strength. Redco™ Polyvinyl Chloride (PVC) is available in both a flexible or rigid material that is chemically nonreactive. Redco™ PVC has a broad range of applications, from high volume construction related products to simple electric wire insulation and coatings. 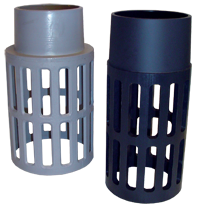 Rigid Redco™ PVC is easily machined, heat formed, welded, and even solvent cemented. Redco™ PVC can also be machined using standard metal working tools and machined to close tolerances and finishes without great difficulty. Redco™ PVC accepts paint and performs well under most silkscreening processes. There are three broad classifications for rigid PVC compounds: Type I, Type II, and Redco™ CPVC. Type II and Redco™ CPVC offers better heat and chemical resistance, as well as greater impact resistance. Available in rod and sheet. Flexible Redco™ PVC is available in sheet and flexible tubing. Nuts, filters, signs, tanks, bolts, valves, bushings, tank and pool liners, laboratory equipment, ducts, sprinkler systems, photo-mounting, wall-coverings, pump parts, fittings, etc.